This workshop will examine current and future technological infrastructure available at Ocean Networks Canada's cabled observatories (focusing on the NE Pacific NEPTUNE Observatory) for cutting-edge deep-sea research. The overall goal is also to strengthen research collaborations and foster partnerships between INDEEP researchers and Ocean Networks Canada. Introduce NEPTUNE Observatory infrastructure to the INDEEP research community. Present Ocean Networks Canada's current research themes. Learn about INDEEP’s research goals and current initiatives - from 4 Working Groups. How can Ocean Networks Canada's infrastructure help INDEEP achieve its research goals? Discuss ship and Remotely Operated Veehicle (ROV) funding options for sampling and experimental deployments at NEPTUNE observatory sites. Plan possible integration of databases and educational/outreach initiatives. Workshop agenda; click to open pdf version. All participants are flying in through Sidney airport (YYJ). The Workshop Overview document includes a map showing the route between the airport and downtown Victoria, where the hotel Harbour Towers is located. The distance is approximately 27 km and takes ~30 minutes. A cab ride costs about $65 CAD. Riding the bus using the regular public transit system, BC Transit requires 1 hour 25 minutes and costs $2.50 CAD. Bus routes and numbers are also shown on the map. For those staying at the Harbour Towers, it is located only one block from the waterfront (345 Quebec street), near the Parliament building, Royal BC Museum, Fisherman’s Wharf, Ferry and Seaplane Terminals, etc (see map). A cab ride from the Hotel to The University of Victoria costs ~$20.00 CAD. Participants are advised to organize to share cab rides. Plan to leave the hotel no later than 8:00 am. An ice-breaker will happen in the early evening of the first day of the meeting (Wednesday, 23 April 2014), around 6:30 pm. We will coordinate cabs or car pools and go straight from UVic after the end of the workshop afternoon session. We will gather at the Fairfield private patio of the Blue Crab Seafood House, which is a local favourite and is conveniently located at a 5-min walking distance from the Harbour Towers Hotel. The workshop will take place at University of Victoria David Turpin Building’s, in video conferencing rooms A144 and A137. 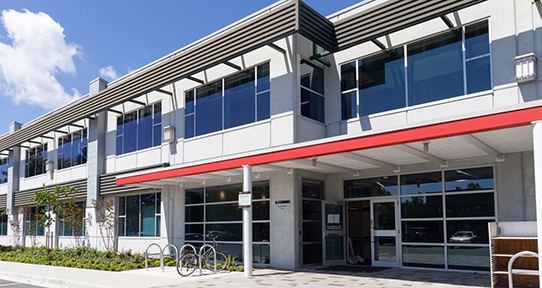 Ocean Networks Canada headquarters are located at the Technology Enterprise Facility (TEF building), which is an 8-10 minute walk from the David Turpin building. We will organize a tour of our offices for workshop participants (see workshop agenda). David Turpin Building (above) and Technology Enterprise Facility (below) on the University of Victoria campus. Large-sized maps for the whole University of Victoria Campus and for David Turpin Building are included below. The University of Victoria campus is distributed around Ring Road. All department and administrative buildings, libraries, sports facilities, student centre and housing are located within and surrounding Ring Road, with extensive adjacent green areas (photo). We will organize picnic lunches every day in a different area of the campus, weather permitting. David Turpin Building (above map) was formerly called the Social Sciences & Mathematics Building. The Technology Enterprise Facility (second map above) is located outside Ring Rode on the University of Victoria campus. The cloud-based video conferencing system (BlueJeans) is available in David Turpin Building rooms A144 and A137. Connection details below. All online participants are required to test their own connection prior to the call, using the computer and network environment in which they’ll be making the call. University of Victoria staff at David Turpin building are unable to provide support to participants who do not pre-test. If participants encounter issues when testing their connections, please contact BlueJeans support or call them at +1 (408) 791-2830 in Canada, +44 0800 014 8214 in the UK and +61 280363149 in Australia. Video conference sessions begin 30 minutes before the scheduled meeting (8:30 am PST, 4:30 pm GMT of April 23rd), so online participants can connect early. Below are simplified instructions for the connection. For more details, please refer to the BlueJeans Getting Started Guide, or the view the tutorial videos. The same connection instructions are valid for the whole duration (3 days) of the workshop. Before starting, please be sure you have a computer with webcam and microphone ready. Locate and click the “Join Meeting” button in the blue rectangle on the first page of the document. A web browser window will open. You will come to the BlueJeans Network “Log in” page. Type in your name and email. From the drop-down menu, select “Browser” or “Skype” (“Browser” is recommended). If you choose “Skype”, there will be additional steps. Please refer to the Getting Started guide for assistance. Once you are connected, you should be able to see and hear the participants in the video conference room. If not, you may need to click the gear icon to change your speaker and microphone settings. When testing the connection, you will see a screen like the one above, with a lovely parrot that will reply to any of your sentences or noises (quite funny actually!). You can see Fabio whistling to the parrot here. Here is an example of the screen you will see when connected, except that in the centre you will actually see the meeting room. We at the meeting room will see the mini-screens with the first 9 participants to join. After the 9th participant, they will not be shown at the main screen but will still be connected. The current person speaking is displayed at the centre of the screen.